Promoting your brand alongside a retail brand ensures your items deeply resonate with your consumers. Connecting your brand with the latest retail brands provides your products with longevity and your customers with tokens that truly show your appreciation. All this is true. But where should you begin? How do you know which retail brands will resonate with your audience? Choosing the right retail brands for your audience doesn’t have to be difficult. In Retail Brands You Know and Love, we’ve highlighted some of the biggest and trendiest retail brands we can offer you and sorted them by lifestyle demographics in order to help you reach your customers with the right brands they’ll love and keep, every time. After all, the longer the item is kept, the more impressions it makes on the recipient and everyone they come into contact with. Say ‘sayonara’ to boring branded travel gear. With some of the biggest retail brands in travel available, you can hit the road, sky or sea in style. Brands like Arc’Teryx and InCase show your travel audience that you understand their needs and want to help with quality branded products. Household names create hype in the home and for your brand. High-quality home goods elevate the area where they spend the most time and provide long-lasting impressions. If your audience is comprised mainly of homebodies, brands like Graf Lantz and Ranger Station are sure to delight. Run, don’t walk, to work with some of the most recognizable retail names in active gear. When marketing to wellness warriors and fitness junkies, name brands such as FitBit and Specialized Bike will turn heads and ensure that your brand is appreciated and noticed. Elevate outdoor experiences with retail names that represent rugged durability and uncompromising quality. 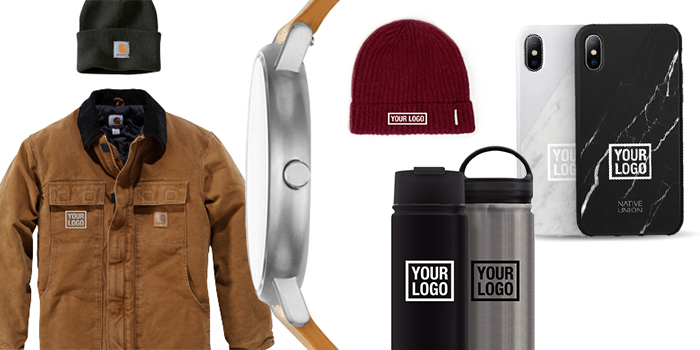 Take your brand out into the Great Outdoors by utilizing your logo on retail brand products from names like Carhartt and Hydroflask to make a splash with your outdoor-loving audience. Utilizing premium retail brands that give back to causes that matter encourages unity and togetherness year-round. We can help you relate your name to retail brands like Liberty and Cotopaxi that are working to create a better world for everyone. This is just the beginning. We partner with thousands of retail brands. Let’s work together to find the right one for your brand based on your marketing and creative needs.